Finance Minister Arun Jaitley delivered his government's last full year Budget speech for financial year 2018-19. He began his speech by highlighting the government's economic reforms undertaken in the last four years and its achievements. Jaitley said that this year's Budget will focus on strengthening agriculture and rural economy and the government was committed to double the farmers income by 2022. The Finance Minister further said that the government with Niti Aayog will also devise mechanism to ensure that the farmers get the minimum support price. He said that the country has grown on an average of 7.5 per cent in the first three years of the current government and has become a USD 2.5 trillion economy. "We hope to grow at 7.2 to 7.5 per cent in the second half of the current fiscal," he said. Jaitley further said that India has already become 7th largest economy of the world and it is expected to become 5th largest economy soon. 06:41 PM: Niti Aayog CEO Amitabh Kant said that pilot projects on electronic health records, land records and digital certification to push the Budget announcment by FM Arun Jaitley. Taking FMs Budget announcement forward NITI will run pilots on Electronic health records,land records & digital certification. Wherever people need to establish a trusted, shared, unique record blockchain technology can help by simplifying processes and removing intermediaries. One good thing in #Budget2018 is the health insurance scheme to cover 500 million Indians. But the budget figures show no serious allocation for it, &the Fasal Bima Yojana has already proved a boon for insurance companies more than the insured. Will it prove another #jumla? 06:22 PM: Fraud of MSP only for Kharif i.e. Elections: Cost of production used by govt does not include costs of family labour & land rent, which is the global norm. We reiterate our demand for bringing a law giving farmers the Right to Sell at MSP, says CPI (M) leader Sitaram Yechury. Cost of production used by govt does not include costs of family labour & land rent, which is the global norm. We reiterate our demand for bringing a law giving farmers the Right to Sell at MSP. 06:16 PM: The Budget proposals should have been bold and radical, and backed by adequate provision of funds. Unfortunately, the Budget proposals are a big let down, said Congress leader and former Finance Minister P Chidambaram. 22,000 rural haats to be developed and upgraded into Gramin Agricultural Markets to protect the interests of 86 per cent small and marginal farmers. Two New Funds of Rs10,000 crore announced for Fisheries and Animal Husbandary sectors; Re -structured National Bamboo Mission gets Rs 1290 crore. Loans to Women Self Help Groups wil l increase to Rs 75,000 crore in 2019 from 42,500 crore last year. Outlay on health, education and soci al protection will be 1.38 lakh crore. Tribal students to get Ekalavya Residential School in each tribal block by 2022. Welfare fund for SCs gets a boost. Rs 5.97 lakh crore allocation for infrastructure. NITI Aayog to initiate a national programme on Artificial Intelligence. Centres of excellence to be set up on robotics, AI, Internet of things etc. To control cash economy, payments exceeding Rs 10,000 in cash made by trusts and institutions to be disallowed and would be subject to tax. Tax on Long Term Capital Gains exceeding Rs 1 lakh at the rate of 10 percent, without allowing any indexation benefit. However, all gains up to 31st January, 2018 will be grandfathered. Proposal to introduce tax on distributed income by equity oriented mutual funds at the rate of 10 per cent. Proposal to increase cess on personal income tax and corporation tax to 4 percent from present 3 per cent. Exemption of interest income on deposits with banks and post offices to be increased from Rs 10,000 to Rs 50,000. Increase in deduction limit for medical expenditure for certain critical illness from Rs 60,000 (in case of senior citizens) and from Rs 80,000 (in case of very senior citizens) to Rs 1 lakh for all senior citizens, under section 80DDB. Proposed to extend Pradhan Mantri Vaya Vandana Yojana up to March, 2020. Current investment limit proposed to be increased to Rs 15 lakh from the existing limit of Rs 7.5 lakh per senior citizen. Customs duty on crude edible vegetable oils like groundnut oil, safflower seed oil hiked from 12.5 per cent to 30 per cent; on refined edible vegetable oil from 20 per cent to 35 per cent. Customs duty on imitation jewellery hiked from 15 per cent to 20 per cent; doubled on all watches to 20 per cent. Import duty on LCD/LED/OLED panels, parts of TVs hiked to 15 per cent; duty on smart watches, wearable devices, footwear doubled to 20 per cent. Import duty on fruit juice raised from 30 per cent to 50 per cent. Customs duty on perfumes, dental hygiene, after-shave, deodorants, room deodorizers, preparations for use on hair doubled to 20 per cent. 11:00 AM: Finance Minister Arun Jaitley begins his Budget 2018-19 speech by highlighting the government's economic reforms and its achievements. 10:30 AM: Finance Minister Arun Jaitley meets Prime Minister Narendra Modi in Parliament. 9:55 AM:Finance Minister Arun Jaitley arrives in Parliament for Budget presentation. He will begin his Budget speech at 11 AM. 9:44 AM: Union Budget 2018-19 papers arrive in the Parliament. 9:40 AM:Finance Minister Arun Jaitley meets President Ram Nath Kovind ahead of his Budget 2018-19 presentation in the Parliament at 11 AM. 9:18 AM:Ahead of Arun Jaitley's Budget 2018-19 presentation, Sensex opens 157 points higher to 36121, Nifty up 41 points to 11,067 level. 9:15 AM: If Dalal Street reports are to be true, Arun Jaitley may impose LTCG tax on equities which will make the investment class less attractive to FIIs, DIIs and retail investors. 9:10 AM: Arun Jaitley's Day Plan: Finance Minister Jaitley will begin his Budget speech in Parliament at 11 AM. He will hold post Budget press conference in evening at 4 PM. The Finance Minister will also hold discussion with Economic Advisory Council at 4:30 PM. 8:59 AM: As per ritual, Finance Minister Jaitley poses with Budget briefcase and heads to Rashtrapati Bahavan to meet President Ram Nath Kovind. 8:44 AM: Finance Minister Arun Jaitley reaches North Block office and he will deliver his Budget speech in Hindi. 7:45 AM: People expect Finance Minister Arun Jaitley to deliver on Prime Minister Modi's promise of doubling the farmers' income. Small businesses, which have traditionally formed the core support base of the BJP, too may get some sops to ease pain caused to them due to the chaotic rollout of the Goods and Services Tax (GST) and demonetisation. Arun Jaitley is also expected to enhance allocations on infrastructure projects like highways and railways to boost economic growth and generate more jobs. Chief Economic Adviser Arvind Subramanian has indicated that the government may be willing to ease off on the strict fiscal deficit target which would provide more headroom for the finance minister. 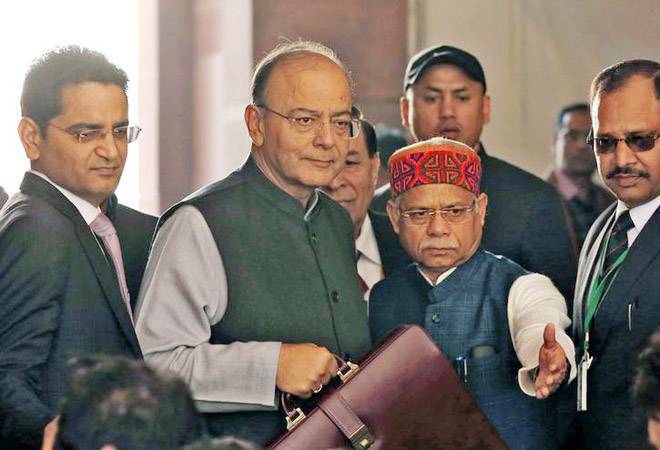 Jaitley had previously set a target to lower the fiscal deficit to 3.2 per cent of GDP in the current fiscal and to 3 per cent in 2018-19 budget to be presented on Tuesday. This will also be the first budget to be presented after the introduction of the new GST regime. As a result the finance minister will have less leverage in changing tax rates since central excise duty on goods and service tax have both been subsumed in the GST and he no longer has the sole power infrato fix rates on them. Another constraint for the finance minister is the increase in international oil prices to around $70 per barrel. The country imports close to 80% of its crude requirement and while high oil prices fuel inflation it also increases the country's trade and current account deficits. Some kind of incentives to boost exports of certain sectors may be announced while there may be announcements for start-ups. The finance minister may also impose a capital gains tax on investments in stocks so that other forms of investments such as fixed deposits in banks turn more attractive. While India Inc. is hoping the finance minister will finally show some movement on his 2015 promise to lower corporate tax rate to 25 per cent from 30 per cent over four years this may not happen given the pro-poor tilt in a pre-poll budget. Scrapping the colonial-era tradition of presenting the Budget at the end of February, Jaitley had for the first time presented it on February 1 last year. The presentation of the budget was advanced by a month to ensure that proposals take effect from April 1, the beginning of the new financial year. Besides, the nearly century old tradition of having a separate budget for the railways has been dropped. The railway budget now forms a part of the general budget. This will be the last full-fledged budget by the present Modi government as a vote-on-account or approval for essential government spending for a limited period is taken in the election year and the full budget is presented after the new government is sworn in.